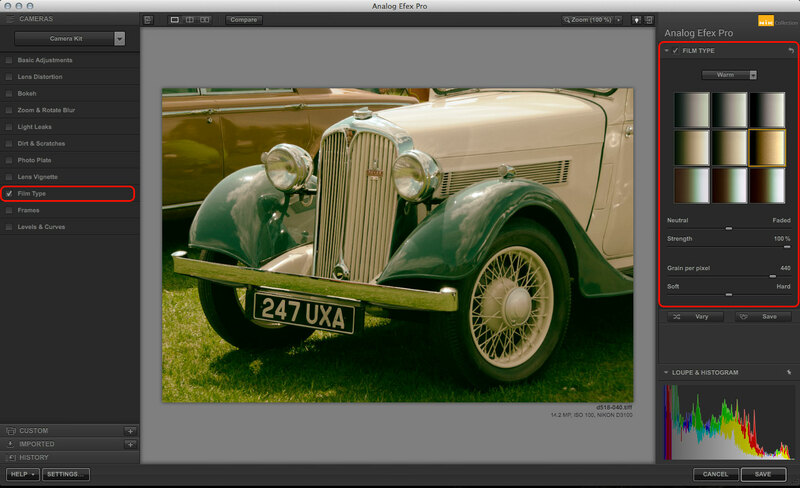 Analog Efex Pro is a brand new addition to the Google Nik Collection, the set of plug-ins for Photoshop, Elements, Lightroom and Aperture that Google took over when it bought out Nik Software. You can find out more at the Google Nik Collection website. I rate this as the best set of plug-ins ever made, and practically a must-have for digital image-editing fans. It’s a tool for simulating the look of old films and cameras, right down to authentic-looking textures, scratches and light leaks. 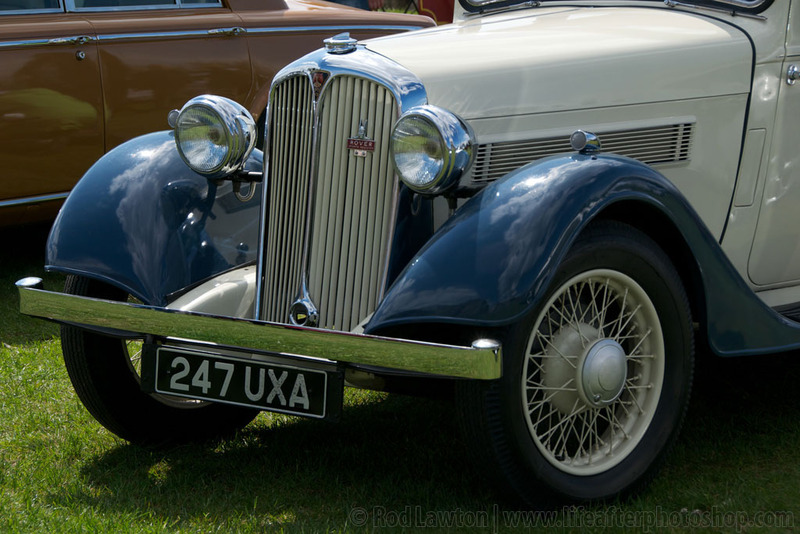 I took a quick tour of the basics in Part 1 of my Analog Efex Pro mini-series yesterday, but this time I’m going to look at the Analog Efex Pro Camera Kit using this thoroughly modern digital image I shot at a car show. This is the last option on the Camera menu, but also the most powerful, because it enables you to create your own analog effects from scratch. I’ll also show you how you can save your effect as a new custom preset. 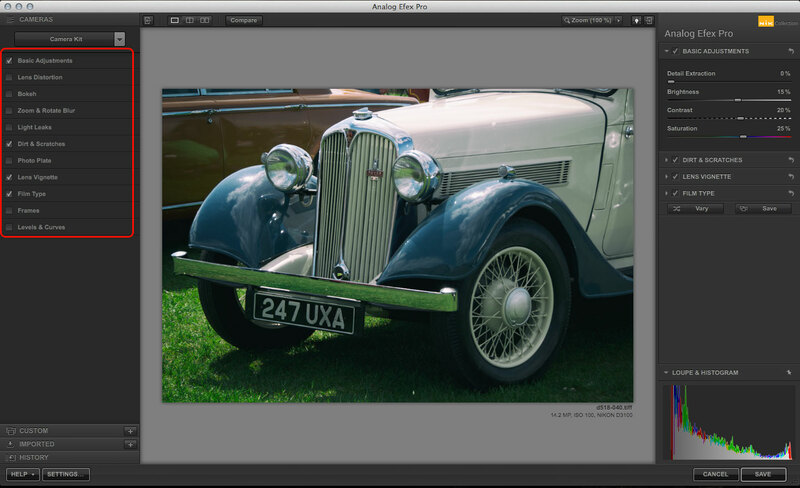 Start by opening the Camera menu at the top left of the the Analog Efex Pro window. You’ll see a list of the four main camera types you can emulate. These display ready-made presets you can try out with a single click, and I looked at some of these last time, but at the bottom is the Camera Kit option, where you get full control. 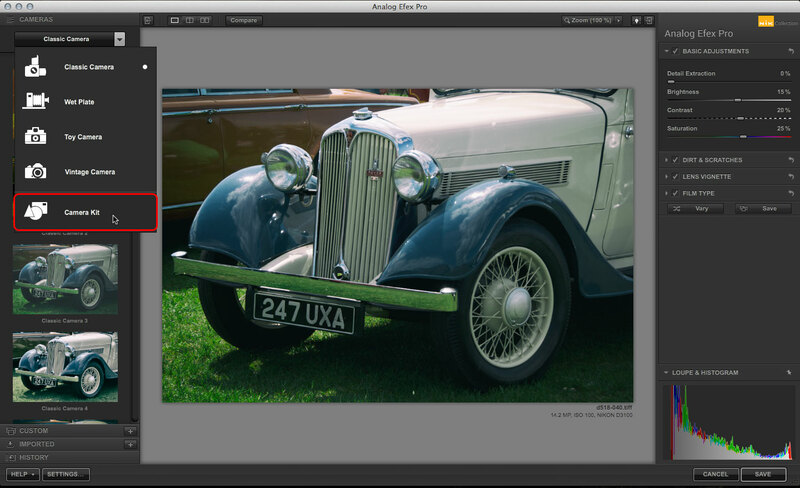 The left sidebar now displays all the components that go to make up an Analog Efex Pro effect. Alongside each is a checkbox, and if the box is checked, the options for that effect appear in as a section in the tools panel over on the right. Not all of the boxes will be checked – it depends on the preset you last used. I’m going to start from scratch by de-selecting all the effects except ‘Film Type’, which I’ve circled in the left sidebar. Over in the right sidebar, you’ll see there’s just one panel (also circled), for ‘Film Type’. I’ve selected ‘Warm’ from the pop-up menu to show a selection of warm film effects. I like the look of number six (second row, far right) – you can see the effect on the main image as soon as you click a button. Previous Previous post: New DxO Perspective for Mac free until November 3rd!